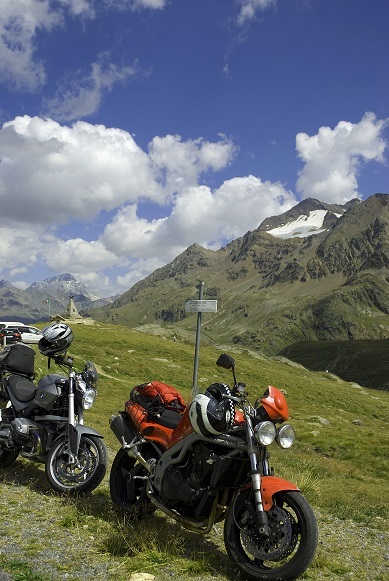 Santa Caterina is located at the foot of the Passo Gavia: a perfect tour stop for biker! Santa Caterina, located at the foot of the Passo Gavia is a small quiet town, situated on the road between Passo del Tonale and Bormio, the ideal tour stop for an overnight stay or more nights starting point for bike tours in north Italy, the Dolomites and Trentino. Hotel Sport***, well-runed by the Pedranzini Family, is located in the center of Santa Caterina. For many years, tour operators, Motoclubs and bikers traveling in the area, appreciate this hotel for its professional service and friendly atmosphere, cozy rooms and its fine cuisine. S. Caterina can be one of the stages of the Transalp or it can be a great starting point for motorcycle rides in the area. Whether you stay at the hotel only for a day or for several days, you'll feel right at home here! The hotel can accommodate groups of up to 70 motorcyclists and offers its guests well appointed rooms, double, triple and quadruple rooms with shower / WC, satellite TV, telephone, safe, some of them with balcony. The food is excellent and offers a rich breakfast buffet, choice of menu every night with a buffet of salads and a wine cellar stocked with local wines and delicious beers. It has secure private parking and offers a laundry service that ensures you receive your motorcycle outfit washed and dried the next monig before you leave. Among the services the Hotel also offers an Internet Point. If you are curious to get to know the Hotel Sport personally on your way over the Gavia Pass (Passo Tonale - Ponte di Legno - Bormio), Norberto Pedranzini will be happy to welcome you and is happy to help you on any questions about fees, housing or the region. He will be pleased to assist you during your stay and give you ideas and suggestions for the choice of your routes. Enjoy the summer on your bike ........ in the unforgettable natural setting of the Stelvio Nationalpark! S. Caterina in summer is the ideal destination for the true biker, looking for relaxation, sports and nature. This lovely, small mountain village in the heart of the Stelvio National Park offers bike tours, day trips, sports activities for the highest demands. Also suitable for a summer vacation with biker friends and family, we recommend our centrally located hotel, recently renovated, equipped with all comforts and an excellent cuisine. We offer daily tours for motorbikers, with or without a guide. Secure parking, also covered. Good MOTO STOP for one night in our resort.